Enabling Best Outcomes: Importance of Early Diagnosis and Early intervention in Children with Cerebral Palsy. Cerebral palsy (CP) is the most common physical disability in childhood, it affects the child’s movement and posture. Cerebral means ‘of the brain’ and palsy refers to ‘a lack of muscle control’. It is a permanent life-long condition caused by an injury or interferences that occur in the early development of the brain. These disturbances can happen either during pregnancy, shortly after birth or before the age of two years. 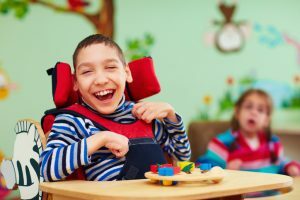 Cerebral palsy not a single condition, there are different types and degrees of impairments depending on where and how the disturbance occurred. Consequently, CP affects body movement, muscle control, muscle coordination, muscle tone, reflex, posture and balance. It can also impact fine motor skills, gross motor skills and oral motor functioning. Physicians usually diagnose CP in children between 12 to 24 months of age, but a new study states that cerebral palsy can be diagnosed as early as five months after birth. To achieve accurate early diagnosis a combination of standardized tools that include neuroimaging as well as neurological and motor specific assessments. This study is a review of previous studies looking for evidence accurate early prediction of cerebral palsy. They also collected the best evidence about early interventions in children with CP to improve their neurological and motor function. The authors analyzed six reviews and two evidence-based clinical guidelines. These studies supported the idea that early clinical signs of CP can be detected before five months of age by a combination of standardized tools in addition of child and mother clinical history. Magnetic resonance imaging (MRI), with 86 to 89% of sensitivity. Prechtl Qualitative Assessment of General Movements (GMs), with 98% sensitivity. This assessment measures spontaneous movement patterns in young infants between preterm and 5 months of age. Hammersmith Infant Neurological Examination (HINE), with 90% sensitivity. The HINE is an easily performed and relatively brief standardized neurological examination for infants between two and 24 months of age. MRI, with 86 to 89% sensitivity. Developmental Assessment of Young Children, with 83% sensitivity. This tool measures the abilities of young children in cognition, communication, behavior, social-emotional and physical development. Even in low-income countries, where MRI is not available, early detection can be very efficient using the Hammersmith Infant Neurological Examination (HINE). Nevertheless, when the clinical diagnosis is suspected but cannot be made with certainty, it is recommend using the interim clinical diagnosis of “high risk of cerebral palsy” until a diagnosis is confirmed. As stated by the World Health Organization, identification of the infant at risk for CP and others neurodevelopmental disorders is a crucial starting point to establish a close relationship between parents and health care providers, and to provide early intervention. The mean goal of early intervention is to minimize motor, cognitive, emotional impairments. New discoveries in neuroscience indicate that early intervention maximizes neuroplasticity in children with CP and minimizes deleterious modifications to muscle and bone growth and development. Therefore, the remarkable potential of the brain development between preterm and 1-year of age offer the best opportunity for early intervention. Brain and muscle plasticity in response to therapies has been demonstrated in children with CP of different age ranges, confirming that neuroplasticity is a lifelong continuous process that enables the brain to change and rewire in response to stimulation. However, is well known that delays in diagnosis of cerebral palsy are associated with worse long-term motor function, parental dissatisfaction, and higher rates of physical and mental health deterioration. Additionally, there is increasing evidence that the infant’s motor behavior, with active interaction with the environment, controls and promotes growth and development of musculoskeletal system, as well as enhancing overall child’s function. The best practice will involve comprehensive multidisciplinary programs based on active interventions including physiotherapy, occupational therapy, psychological, and neurodevelopmental management. Consequently, intensive, repetitive, task-specific intervention for CP ought to start as early as possible while the brain is most plastic. Therefore, to achieve long term best outcomes the clinical diagnosis of cerebral palsy or high risk of cerebral palsy should always be followed by a referral to cerebral palsy–specific intervention and emotional support for the parents or caregivers.